Due to guests' schedules, this year at the Blue Door, Thanksgiving dinner was served on Friday. I roasted one of Diestel Farm's Organic Heirloom turkeys, a smallish bird weighing in at 13 pounds. I was very pleased with it. I applaud breeders for making the effort to breed good turkey flavor back into turkeys and I like to support their effort by buying these more expensive birds. Even though I have fresh herbs in my garden, I still use Bell's Poetry Seasoning* in my dressing. I recommend that you get a box, and get into the habit of roasting a whole chicken periodically, maybe for the traditional Sunday dinner, which gives you great left-overs for Monday lunch or dinner. Consider it training for the annual turkey. 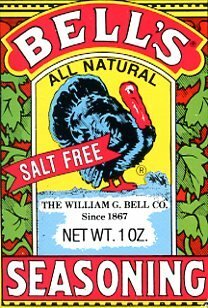 *It's actually Bell's Poultry Seasoning, but a grocery clerk mis-heard my request for it in the store once and asked his supervisor if they carried Bell's Poetry Seasoning. I just love the idea of poetry seasoning.